There is still some mystery as to what happened to Cowell’s villa. There is a plaque outside Queen’s Park villa, or Pennant Lodge as it was known until 1983, stating that it was built in 1851. It seems unlikely to me that a villa less than twenty years old would be knocked down and a new one built on the same plot. Also a Lady Emma Pennent was residing in Queen’s Park in 1845 and not at Attree’s villa. There would appear then to have been more than one villa throughout the 1840s. The most likely explanation seems that Cowell’s villa was rebuilt and became known as Pennant Lodge. As yet I have found no records to prove this though. Attree’s Villa was designed in the style of an Italianate villa set in a terraced garden with a little gazebo. 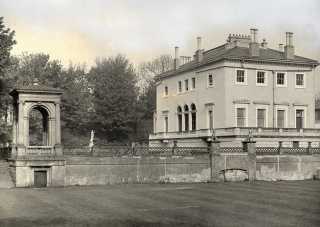 After Attree’s death it was purchased by George Duddell and occupied by him until his death in 1888. It then remained empty until it opened in 1909 as Xaverian College, a college for Catholic boys. The college closed in 1966 and the villa became derelict and was repeatedly vandalized. The villa was full of dry rot with wet rot fungus on all the floors and the cost of restoration was put by the Department of the Environment at between £130,000 and £150,000. Despite a huge public protest and the fact that the Historic Buildings Council classed the villa as an ‘outstanding’ Grade 2 listed building, the villa was demolished by the Council in 1972 because of the cost. All that remains now is the villa’s garden gazebo, which used to have a marble statue of the Emperor Aurelius in it, and the Pepper Pot tower, which has become a local landmark. I attended this school from 1930 to 1937. Are there any pupils out there able to contact me? Hi Colin, you were there a bit before me. I went to Xaverian in 1943 into Brother Christopher’s Class (3) and finished up in Lower V in 1947. Brother Aloiyus was the head. George Duddell was my ancestor, I now live just off Queens Park in Stanley Street and didn’t realise he lived there until my grandma told me – small world! I attended Xaverian College for a year from September 1950 to the Summer of 1951. I emigrated to the States in 1956. I have only just now discovered that the school is no longer…what a shame. I enjoyed my brief time and I would like someone to help me recall the names of the brothers there. I was at Xavarian College Brighton from 1959 to 1963. The notable Brothers to me being Bro Michael (Maths), Bro Lawrence (Geography) and Bro Beade (can’t remember the subject but I recall he carried a cricket stump as an attitude correcter!). Like Ted, I now live in the USA. The picture on this site brings back loads of memories. Does anyone remember the air raid shelters by the sports field? Seeing such a nice place and knowing that the place is now lost. I have a watercolour of it presented to Thomas Attree. I attended Xaverian in the early 1960s and duly remember Brother Michael et al. I remember my form master Mr Guyver who to us boys was the model of good dress, manners etc. I remember throwing caps in the park pond and getting really dirty at lunchtime playing football and bulldog on the ‘ranch’. In April we were expected to swim in the sea and on occasion to get ourselves from school to the King Alfred baths in Hove for swimming. We were also trusted to walk up to the race course for cross country running. I travelled to school each day by steam train from Steyning and would often walk from Brighton station to and from school to save my bus fare. I have some very happy memories in some respects – like serving staff lunch once a week in the staffroom which was basically in the cellars or at least it felt like it. As a reward I got to eat my lunch in the kitchens. I too attended this wonderful school in the early 60s with Mr Guyver as my friend and teacher and M. Smith as the feared tyrant of discipline! Looking back now with much affection for those long lost days which never seemed to have an end I’d love to meet all those ‘kids’ again and also the brothers who did give so generously of themselves to train us all to become men of faith and wisdom. Love to have another reunion of those present between 1963 and 1968 – anyone brave enough to get this together?? Any suggestions? I remember being taken to the air raid shelter in the grounds of Xaverian College in about 1941; I had been sent from London to live with my grandmother in Queen’s Park Road. I think we may have spent only one night there, as a man in clerical garb came around and sprayed insecticide in our direction. Gran said if that’s what our side thinks of us we’ll take our chances with the Germans. I was a pupil in Bro Benedict’s class (1953-54) and Bro Raymond’s class (1954-55). A classmate in the last-named was John Sallis – son of Arthur Sallis – who had the wonderful war surplus electronics shops near Brighton Station. I loved my time at XC. I left when my parents moved house and then went to a Jesuit school which I hated. The X brothers were kind and gentle to me – the Jesuits were monsters and I have turned against religion because of them. Here is a partial list of classmates from XC that I remember: Webb, Gold, Chapchal, McGuinness, Hooper. I’ve just come across this site while trying to find out why I couldn’t find the College on the modern map of Brighton(!). I was a pupil there from 1949 to the Christmas 1951. It’s all a bit fuzzy now, but during that time I was in two classes; a reception class in a separate building up the hill from the main school, Brother Brendan, was it – or maybe it was the Brother Benedict that John Rooney mentions? And then the first class in the main building, next to the gym. I’m afraid I can’t even make a stab at remembering the brother’s name there. I think Brother Aloysius was still the Head. I can remember the air raid shelter; the roof was used by the older (than me) boys for playing football with a tennis ball. The only names that come back to me from that time are Crighton-Smith, Steele (whose father owned a butcher’s shop) and a Jewish boy – Espazel (phonetically), who lived in or near Fishersgate. I’ve just spent a delightful weekend at the Goodwood Park Hotel near Chichester. On the walls of their corridors they have prints of old country houses. Amongst them is one of ‘The Park, Brighton’. It is of Attree Villa with the small gazebo and the Pepperpot in the background. I think it is painted from a great height above the hill. I was at the College from 1946 to 1954. I remember the names of some fellow pupils: Storrow, Keichler, Woolgar, Bridge, Warwick, Oram, Collins (sporty), Chilcott (clever), Gurucharri (big), Steele, Forte, Bonetti. Lots of memories, some unhappy, some very happy. The College was a delight especially the landscaped grounds. The Brothers had a traditional kitchen garden, and also kept bees, hens and goats so were fairly self sufficient. High point of the week was art on Friday afternoons when we might sit on the banks sketching the scenery. Bro Gerald ran Art and also tended the hens. Bro Beade (mentioned above) did History. Remember Bro Felix? An incredible character! There was an Old Boys Association, which I regret I never joined, but I bet someone out there has an awful lot of archive material. My younger brother Philip followed my footsteps about five years later, I’ll tell him about this site. I was at Xaverian College from 1936 to 1943 and have very fond memories of my time there and of all the Brothers – two of whom came to my wedding – Brother Bede and Bro Adrian. At 11am one spring morning in 1942 a German plane machined us in the playground (I was in Lower Five). We all fell on the ground and I fell on top of the head, Brother Aloysius! No problems except one boy got his ear nicked. Very much like to hear from any contemporary ex-Xaverian. Sunday evening and quite by accident I have discovered this Xaverian College site. Quite moving. I was at the college in the 50s and have fond memories even if they are rather cloudy. I do remember most particularly Bro Vincent, our French teacher. Thanks to him I leant French and have lived and worked in France for many years. The only fellow student whose name I remember clearly is one Ken West. Salutations Ken if you are out there somewhere. I would be delighted to converse with anyone who was at college with me. I just found this site and noticed one of my old classmates, Danny Cassidy. I was at the Xaverian College from 1963-66 and then moved with the brothers to the De La Salle College. Like Danny, I remember Mr Guyver, Mr Smith (a QPR fan from memory! ), Bros Patrick, Michael, Wilfred and some other somewhat eccentric teachers. I would be interested to hear of news from any former classmates. I now live in Australia. I was at the XC from September 1949 to Easter 1952, leaving when I was in Lower IV. I started at the same time as Anthony Duckworth (17/1/08), but I was in the class next to the gym/ music room. However, I’m sure a couple of the names he mentions, Adrian Bonetti and Forte (ice cream), were in my class. Some of the names of classmates I recall are Roger Payne, Robin Russell, John Steele, Ramon Brookes, Alan Doo, Chris Saunders (he had brothers at school), George Barker, Kenneth Myerscough, Jeremy Heath, as well as Burholt (also had brothers), Chilcott, Matthews, Joyce (a red head also from Littlehampton). I was taught English by Br. Raymond, physics by Br. Campion (I heard he left the order and later married), history by Br. Aiden (the resident bee keeper), maths by Mr Farley, geography by Mr Sawyer, music by Mr Maedle (of the corpulent build and snuff stained waistcoat), but I cannot remember either my French or Latin teacher. I also recall Bros. Felix, Plunkett, Cajetan and Vincent. I consider my years at XC the best years of my schooling. Previously I had been at boarding school in London, (some parents have strange ideas), and after XC at the mercy of the De La Salle Brothers in Sydney, Australia who were dreadful teachers and evil disciplinarians. I remember XC with great affection. I returned to Brighton and wandered over the site three years ago. It seemed very sad to see the redevelopment. My wife and I have moved to France to live in Angers. It is directly west of Paris and in easy reach of cross channel ferries, and planes to the South Coast. If anybody hears of any reunion of Old Boys from the 49-52 era, I would love to know about it, and would certainly attend. Regarding the comment made by Wayne Collyer(25/11/2007). I have a copy of that print you may have seen. I have scanned it in, and have sent it off to this site, and it will hopefully appear on these pages real soon. Just trying to get a date of when the plate may have been created. I will comment on the picture when it appears. I attended the Xaverian College from 1950 to 1962. That school was more like a social club than an educational establishment. The Xaverian Brothers (I think) were more interested in turning out good citizens – exam results were balanced with this tennet. I was very happy there and made friends who are still friends 45 years later. I can remember some of the Brothers: Raymond (nick-name Mo), Cajetan (Charlie), Nathaniel (Nat), and some who didn’t have nicknames, such as Finn Bar, Anselm, Benedict. When I first joined there was “old” Benedict who was a wonderful chap – a real character, later there was “young” Benedict who was from America and taught Maths. He was very strict. Then there were some great (and awful) lay teachers. Geoff Lintott was a truly good artist (I have an original pen and ink by him) and he could bring Shakespeare and Chaucer to life in his English Literature classes. “Taffy” Davis was a good geography teacher. Lambert was a good guy but (I believe) took his own life later on. Esdale was hopeless. He knew his history inside-out but could not keep any kind of control. As I said, I made some fine friends: Vladik Cirin, Danny Chapchal and I occasionally meet up for lunch. In October 2008 we will be having a lunch in London and Michel Olszewski & Doug d’Enno will be there too. I can remember many others and wonder what happened to them: Dennis Hooper, David Sharp (was running a Post Office in Sussex in the ’80s), Vic Sheppard, Jeff Taylor and others. I occasionally look at “Friends United” to see what is happening there and many familiar names are to be seen. I had thought about trying to get a reunion organised but we are all so far away. My best pal – Nigel Behrens – lives in Brisbane..! I work and live in Buckinghamshire and have little reason to go back to Brighton. It would be great to know how well people have fared in life. I have done reasonably well. I run my own firm and operate within the TV broadcast industry. I know others who have done much better than I and I hope therefore that the Xaverian Brother’s teaching methods and their humanity helped us all to have good lives and to reach whatever success we were seeking. I will watch this site for any inputs and if there is interest, I will forward the details of that London lunch in October. We were in the same class 59/60.I remember you well. I retired some 8 years ago and now live in S.W.France. I am still in contact with Jeff Taylor who lives in Marbella and also Bob Rogers. It was sad that the old Xavarian College no longer exists as has my previous Mayfield College that has now been converted into houses and flats. I was in the school in the early 50s, with Br Anselem as headmaster, classmates John Steele, Ray Brookes, Bonetti, Phil Dickens etc and still have a school photo. Some I can put names too. I played football and cricket and used to tour other schools in the area on a Wednesday afternoon and to go to school Saturday morning. What a great school and a great start in life. Would love to get a reunion. I was at XaverianCollege from 1961 – 1965 starting in Brian Guyver’s class, then Brother Mark, and Brother Michael with Brother Lawrence as head, then Brother Elwin. I remember the school trips to Lourdes, and Innsbruck – I think I still have the photographs somewhere and you boy Carter! Weren’t you smoking on the Lourdes trip (same as me – we bought pipes and Gauloises) but I didn’t drink the beer. Also there was the 5 a side in the courtyard, and I remember breaking a window with a stray shot – in front of the whole school – legitimate play but Brother Mark wasn’t please and gave me the bill he he. Was at the Xavarian from 1960 until it transferred to the De la Salle in Hove where I attended for one year.I must have been at the school at the same time as some of you but I don’t remember the names. I do remember some of the teachers – Mr Guyver, Mr Smith, Mr Lambert etc. I remember the brothers especially Bro. Michael and Bro. Mark. I also remember the 5 a side games on the quad, bulldog on the ranch and the trip to Lourdes.There is no one I am in touch with and it would be interesting to hear what has happened to the people who were at the school at the same time. I was in touch with David Benham-Hermetz for some years and other names that spring to mind are Greatorex, Yeomanson, Hammond, Moony, Cooney, Kidger. I remember there were a couple of reunions around 1969 – 1970 that I went to but I don’t know of any more recent than that. Like some others I now live abroad, in Cyprus, having taken early retirement in 2002 but I would be interested to be reminded of any others who were at the school, particularly from the same year, and of any reunions that are planned. Hi fellows: I stumbled on this site while researching the Magdalen Sisters. I was at Xaverian circa ’61 until we moved to the Sacred Heart Convent. I remember all the teachers from that interval..most fondly was Brother John (Herbie) who would help me with chemistry. I also thought Brother Elwin was a saint…nobody mentioned Brother Augustine…he once told me while administering corporal punishment that “the best way to the mind is through the behind!” I visited the area (I have lived in the USA for 30 years) in the summer of 2008. Everything seemed smaller, except Albion Hill that I walked up, retracing the route from Brighton Station. I asked Brian Guyver once if I should study English or Science…he said as science knows no class and I have no class, I should study science…great advice..got a PhD and left the UK. I was at the school from 1961 to 1966, then moved to De La Salle College. Of the brothers, I remember very well Brothers Mark and Michael – they inspired me in different ways and also Brothers John, Timothy, Laurence, all very kindly, Brother Martin who was odd, Brother William, Brother Athanasius, Brother Brendan, Brother Patrick and the two I think of as saintly, Brothers Elwyn and Brother Edmund, the latter, I believe, a prisoner of the Japanese. Of lay teachers, Mr Guyver was indeed an inspiration, but I remember fondly Mr Quinn (Economics and Government), Ralph Lewis (-the Major: English), Henry Higgins (History and Latin), Mr Swann – a brilliant geographer, followed by Brian Smith (not to be confused with the QPR Mike Smith), and others. I wonder who among these is still among the living, and regret the lack of an organisation for meeting old friends. Hello David Simmons. Good to hear from you through this site. Let me have your email address. It would be good to keep in touch. You can get me on mike@argosycable.com Did you know that this week (25th March 2009) is the centenary of our school. Doug d’Enno has been doing some historical research and had quite a lot of information. There are moves to try and organise a reunion so it would be useful to build a list of email addresses of interested parties. I came on this site by accident and was delighted to find it and see so many familiar names from 1960 to 1966. Of the Brothers – Wilfred (now James) is in Eccles, Patrick in Bournemouth, John in Herne Hill, William in Liss. I’m in a Brothers’ school in a poor area of the coastal desert of Peru. I’ve been here for 15 years. We had a good reunion in 1992 at the Queen’s Hotel. It marked various anniversaries – 25 years of the entry of girls, many celebrating 40th birthday and my 40 years in the Brothers. A lovely occasion and worth all the effort. God bless to all of you. There is a small reunion planned for 20th July in London. We are up to nine for lunch and plenty of wine. We couldn’t increase by more than a couple. We are all from my generation – born around ’45 or ’46 and were at Queen’s Park for O Levels. Get in touch with me if you need more info. mike@argosycable.com Good to see the message from John Bennett. John, I travel in the U.S.A. quite a lot. Where are you living? I might be able to meet up at some point. Like Bro Mark I stumbled across this site whilst aimlessly surfing the net. I was at Xaverian College from 1961 until the summer term of 1966, after which I moved on to Brighton College. It’s really stretching the memory to try and recall all the names from back then. I recall James Symington was a good friend of mine at the time. He lived in Rock Place. His father was a cartoonist. And I’m sure I remember both James and Gervais Seymour. But the dates Gervais says he was at the college don’t fit with my own. I also recall Mr Lambert and the numerous lessons where we had to sit quietly reading a boring history book or face his wrath. Mr Guyver was nice guy I seem to remember. Didn’t he teach us to play the recorder? Am currently in Canberra, Australia serving in my umpteenth diplomatic posting with the Foreign & Commonwealth Office which I joined back in 1972. What a surprise finding all this info on Xaverian College. I was there from the mid 1950s through to leaving the De la Salle College, as it became, at eighteen. Loads of familiar names; teachers and pupils. Anyone thought of setting up a website, Facebook group or similar? If anyone is interested in getting in touch with me my email is: ajg@headofthecurve.com or join my very new business networking website: http://www.headofthecurve.com and make contact that way. Maybe hear something soon! Tony Grantham. I attended the college from approximately 1959 to 1967 where, of course, the change to De la Salle College took place during that time and I have to say I preferred my time at Xaverian. Reading some of the accounts has evoked some strong memories, my first headmaster was Brother Augustus. My first class master was a delightful old gentleman Brother Edmund in Prep 1 in one of the old buildings, my classmates at that time were William Ward, Marcus Milton, Sawyer, Wagstaff, Bond, Saunders, Quail, Greengrass (ginger haired boy), and was it Lonsdale or Drysdale (only black boy in the school) and others, but memory as it is, well you know. As I recall the cricket bat wealding brother was Brother Patrick, Brother Guyver was a great influence on me especially recitals of Horatius Holds the Bridge from Ancient Lays of Rome and hope and trust he found what he was searching for in life. Did he not have some form of duelling scar to the side of his face? I do indeed remember the ghost train in the old air raid shelters as I was one of the conspirators that got punished severely for frightening the life out of the younger boys, at the time a major offence. Not one of our better ideas for earning a few bob which I seem to remember investing some of the proceeds into establishing some form of tuck shop at the bottom of the steps to the basement of the old building. Does anyone remember the school being under siege from those delightful children from St. Luke’s one brave day with bicycle chains and various implements flying over our walls. Some of the Brothers and the meatier boys I seem to recall had to go out and scatter them. I seem to remember that at that particular time it was a very dangerous place to walk through Queens Park on your own and we had to go in ever increasing numbers. Did anybody else feel as daft as I did having to wear a cap? Here are some other names that people might remember, apart from the ones that have already been recalled, how about Brother Chad, an unusual character, it can’t be that he married a German Countess can it? Brother Kieran a pocketsized Hercules, Brother Wilfred (headmaster). I know Brother Athanasious has been mentioned but I always found him a curious character and wonder whatever happened. Anyway, that’s about all I can remember off the top of my head. Currently living in Somerset, own house (just), happily married, 4 sons, just about able to write. There’s another thing, am I imagining this as well, being initially born left handed and having to retrain to be right handed as left handedness was thought to be ‘unusual’. I remember Danny Cassidy and I’m pretty sure we’ve been to each others houses as we lived close to each other. These things seem very foggy, whether or not this is attributed to simply the ageing process or the long term effects of alcohol it is difficult to say. Anyway, perhaps somebody with a clearer memory than mine might be able to fill in a few more gaps. Of course it was Brian Guyver – as usual couldn’t see the keys without my glasses. This is just to let everyone know that we did have a small reunion lunch in London in July. There were nine of us, all having been in the same class, which means we are all around 64 or 65 now. We met in a lovely restaurant in the Holland Park area and had a delightful time catching up on everything that had happened to each of us over the intervening 45 or 50 years. None had changed. All were just as much fun as before. The names were Danny Chapchal, Vlad Cirin, Chris Ogden, Roger Durrant, Pee-wee Allen, Michel Olszewski, Vic Sheppard, Doug d’Enno and myself. Much had indeed happened to all of us but all seemed to be happy with the way life turned out. We will do it again, probably in Spring and probably again in London. Do please get in touch if you want to go on to our little e-mailing list for the reunion. Meanwhile, compliments of the season to all. I attend XC in the early to mid 50s and remember well Brother Anselm who damaged his wrist caning the whole class because someone would not own up to some misdeed. He was followed by the American Brother Nathaniel as headmaster. “Nat” was from Boston and became a bit controversial with his American expressions. My class mates were Paul Maxwell, Michael Harwood, Paul Steele and Bonetti “the English goalkeeper” Frank Bugden. I have lived in British Columbia, Canada since the late 60s and have travelled the world, I would be delighted to hear from my former class mates. My father, Kenneth Noel Prior, was at Xaverian College from from 1931 (when he was nine years old) to 1938 (I think). I believe that one of his contemporaries was Donald Sinden, the actor. Any confirmation of these dates or any other information would be gratefully received. I have been trying to find out about my father’s old school and was delighted to come across this site. He was called John Lloyd Eley and was there in the 1930/40s before going on to Oxford. I would love to hear from anyone who has information about his time or who knows if there are any records out there. Thank you. Well first, I have to say that I have a lot to be thankful for that I attended the Xaverian. I too stumbled on this site on an aimless late night internet ramble. What a pleasant surprise. I started about 1961 in Brother Edmund’s class in the old Prep’ School and stayed through the sixth form at the Upper Drive, with Brother Mark. My parents wisely pulled me out of the local schools and sacrificed everything to keep me there. I will forever be grateful for that. It now seems like I went from an educational haze to one of clarity and direction. What a miracle. I stayed in the “B” stream throughout and see now that perhaps that was the perfect place for my temperament. For example, I still remember my form master Brian Guyver observing at the start of class one morning (1B) “Horsfield, you are truly quite amoral…” which really got my attention because I thought he was saying I was evil. But then, thank goodness, he continued: “No, not Immoral, Amoral… just like an artist”. Once I looked the word up, I realized he was actually complimenting me in an oblique way. I have held that close all these many years. It struck a chord and gave me a direction and identity that rang true. Can you imagine a teacher daring to say something that poignant and dangerous today? Likewise, Brother Michael, who actually managed to lift the veil on mathematics for me. It dropped again soon after, but Michael actually showed it was possible, even for a numbers-handicapped dolt like me, to “get it”. I was in Brighton in January, having a beer just up the road at the Hanover with a couple of old school friends. I have lived in the States since 1973, but seeing them and my sister, gives me an excuse to go home. I came here for a teaching assistantship and an MFA. At first I hated it but was too poor to go home at Christmas. I got over that and have loved the USA ever since. The energy and directness of its people, their willingness to work hard and be independent of government, etc. After scrambling for survival working in TV for a few years, I started my own film and video business. I have worked across the USA and in various parts of the world. I still work in the Boston and New York area, though I am reeling in the travel. (As all children must eventually say “where the hell did the years go?) Like many of you I still have many vivid memories and even a couple of trophies. Brian Guyver’s (signed) conducting baton, for example, which he occasionally used to get our attention. Also, most of those school group portraits, you know, the panoramic ones. Right through the sixth form, when the girls came (another life changer).I would love to hear from anyone who cares to track me down. Now I live up in the woods of north west Connecticut, surrounded by wildlife and trees (bears, coyotes, beaver, even an occasional Bobcat, Elk or Mountain Lion and even rumors of the odd Canus Lupus). It’s a long way from Brighton, but I doubt I’d have got here if I had not had that school foundation. And lastly, yes, the destruction of that beautiful old property is very disturbing. Apparently the political makeup of the town council at the time, made preservation of symbols of Britain’s past anathema to their religion. Well, Desmond, we were in different classes but at the school for some of the same years. I am in the TV industry and will be at NAB (Las Vegas) in April – do you go to that convention? If yes, we should meet up. Mike and John, thanks for your replies. To you and anyone else who might care to contact me, just do an internet search for Desmond Horsfield and you will find a couple of links via email. I would very much enjoy a chat and finding out what happened to us all! I attended Xaverian between 1959-64. Unlike many of the other subscribers, many of my memories concerning the teaching staff and brotherhood are not as benelovent. One person I shall never forget was Brother Augustine (or Brother Superior as he insisted on being called). His appetite for administering the cane was to say unnerving. Once a week for four years. The year after I left, I understand he left the order and married one of the pupil’s wealthy, widowed mother. Unfortunately for him, our paths crossed during the early seventies in Ramsgate of all places. I believe he got the gist quite quickly on how I viewed his punishment methods and morality. This might sound like sore grapes now, but after all, the man did expel me. The only reason I can think of why he allowed me to stay at the school was that I appeared to be in every school sports team from an early age. Those masters who I remember with affection? Mr Davies, a good man, and ‘tin-tacks Lintott. I remember him cadging a cigarette off me during art. Kids I remember? There was Kench and Butcher, Froud, and of course my old mate Derek Ireland, another soul who suffered under the swishing arm of ‘Adolf Augustine’. Although expelled six weeks before being able to sit for my GCE’s, my life panned out quite favourably. I retired at fifty but got bored, so for the last twelve years have become a novelist and screenplay writer (no use looking, I write under a pen name). I wonder if anyone could shed some light on a problem set me by a friend, Terry Paddenburg? His father Charles Paddenburg was a pupil at the school in 1932/34 approx and can remember being sent to Ditchling (East Sussex) for weekends as his parents lived in Portugal. What Terry doesn’t know is where his father would have lived during those days, and with whom. I now live in Ditchling and as a member of the local historical society, he has asked me to find out anything I can. Perhaps an old pupil may be able to help me or may remember Charles. I do know there was a Catholic community on the Common and also St.George’s Retreat is there. I would love to hear from anyone with relevant information…thankyou. I was at the school from 1951 to 1958 when I left after ‘O’ levels to go into the 6th Form at Lewes CGS. This was in the days when XC had no 6th Form. I remember Roger Durrant (above) but few other names come to mind immediately. My brother John was two or three years behind me and went through the new 6th Form and I recognise a few names above from his year. Very happy days and I remember enjoying cross-country runs round Brighton in the evenings with Bro Finnbarr (spelling?) and excellent science lessons with Bro ??? When I got to Lewes I realised how well he had covered both chemistry and physics. I have a daughter and grandchildren living in East Sussex so do get into the area occasionally. I was at Mayfield XC from 1943 to 1947. Bro Pious was the rather strict head. Bro Gerald taught art, what a lovely man. Bro Anselm taught Latin and I think Maths, another lovely man. Bro Fox taught me to play chess, Bro Thomas taught French and History, and Bro Cuthbert was PE. I have a class photo with him at the centre. Some names I recall, excuse memory here, Ken Griffiths, Watson (marmite & paste! ), Colin Beeson a great pianist, Lomas, David Reynolds, Hartley, the Boris twins, David Longstaff et al. My surname then was Wallis which my Mother changed when she left my Father. A doodlebug landed in the grounds whilst we were on hols. Some of the chapel ceiling came down. I also pumped the organ when Bro Cuthbert played but I let it run down and was in disgrace. I have been back to the grounds just before they gutted it to make very expensive flats. They did up the San as it was listed. Managed to take some pictures which I treasure. Like others I had some very bad times there but also some great ones. I was a protestant, which did not help my cause. Take care everyone, hope I have stirred some memories. My email address is rgwpel@virginmedia.com and I would be happy to hear from anyone old enough to remember me. My tour at Xaverian College was from Sept ’61 to the summer of ’66 when I left to do a 2 year stint at the Sixth Form of what was Haywards Heath Grammar School. (traitor!) I have fond memories of XC and the brothers did a good job given the limited resources at their disposal. Overall, I think they were strict but fair. There was a group of us who used to come up on the 8:17 from Haywards Heath. The athletic types would make it back for the 4:28 out of Brighton while the more sedate folk such as myself most usually had to be content with the 4:38 bound for London Bridge. I think it was not long after we started in ’61 that there was a derailment just outside Brighton station. On parts of the indicator board, the clocks were set to 12:00 as there were, presumably, no trains scheduled to leave those platforms. However, in the mind of an 11-year old who had led a sheltered life, the suggestion was that there would be no trains until midnight which really put the wind up me! I expect some of the teachers would be regarded as a little unconventional these days. Does anyone remember Mr Kerr, the French master? In the absence of a teacher, mayhem was the norm in classrooms and the challenge was to see how long the misbehaviour could continue without being detected by an approaching teacher. With Mr Kerr, it was easy to spot his impending arrival! Being a chain smoker, his approach was given away by rising smoke seen coming from behind the boys’ toilets! Bet the brothers didn’t know that one! Great shame about the house. I think there was an oval loose gravel drive in front of the house. On one occasion, a telegram boy on his red GPO BSA ‘Bantam’ fell off a number of times going too fast trying to show the world what he couldn’t do. Sadly, I came away with a few ‘O’ Levels but didn’t excel in anything. I was useless at art, flunked French (anyone remember the somewhat elderly Miss Baxter, ca 1965? ), indifferent at Maths but picked up a little Physics (Bros Lawrence & William) and Chemistry (Bro John, aka Herbie). I can’t blame the brothers; some folk are just dense! Nothing permeates into their skulls and I’ve been struggling ever since! Good to see further comments. This year is the 50th anniversary of the De la Salles taking over the school. Seems like yesterday. Mr Kerr was a character. I still remember his comment on a school report: “A model pupil – unfortunately not a working model.” If anyone is interested I can be contacted here in Peru at markzap@yahoo.com God bless you all. Just found this page browsing. I must have been there about ’53 / ’56 - recognized quite a few names of students and teachers. I remember the air raid shelters, cricket matches and playing against Chailey. So was my brother Charles RIP. I live in Florida now. Oh well. I cannot believe I found this page after so many years. No. I am not THE Michael Owen but have had a lot of mileage out of it in Malta, Costa Rice and Panama, three of the keenest soccer countries in the world. I attended XV from approximately 1954 to 1957. I knew Peter Bonetti and Bro. Anselm, Bro. Charles and Nat. I was probably me who got the whole class caned as I was the mischief maker for most of the time spent at XV. I was suspended once for diving over the high jump bar as I found I could get better elevation by doing so. The Fosbury Flop was a mystery to me. I believe another occasion for my severe reprimand was because I was the ring leader in setting fire to a railway carriage on the way home to Burgess Hill from Brighton. I left my school cap in the train and forgot to take the name tag out. However, after my final year, I joined the London Metropolitan as a cadet and after basic training in Hendon, was stationed at some of the worst areas of London. My appointment at Deptford nick was most fun, as the Chief Inspector and I would play snooker most of the day. One of my other duties was at Old Scotland Yard in the fingerprint dept and there were a lot of girls working there. As my previous educational years had been spent in an all boys school, the girls were a new experience. I could only stand the discipline for two years and finally got out of The Force. Had some very unusual jobs after that……..Storekeeper in a factory. installing and maintaining lighthouses, fog horns, deep well water pumps, exhibition displays for trade fairs all over Europe. Worked for Watkins and Watson in London installing, servicing and maintenance of pipe organ blowing and humidifying equipment. After getting a divorce from my first wife I went to America and met my new wife in California and worked installing suspended ceilings for many years. After that we moved to the Bahamas, Jacksonville, Florida, Naples, Florida, Punta Gorda, Florida and Woodbine, Georgia. Moved to Panama in 2007 and when we sell our house here we are off to Malta to retire. I am now 69 and would love to be able to contact some of the old class mates and David Matland, who I do not remember. I would like to add another afterthought to my previous posting: I truly believe that we, as boys from XV, do have an advantage over other school environments. We were taught to be considerate for humans and property by being severely punished for throwing rocks at Bro. Charles’s front door. We were taught humiliation by receiving punishment in front of the whole school. We were taught discipline by having blackboard erasers (not rubbers) thrown at us in class and by having an eardrum perforated by a slap in the side of the head by an irate Brother. Imagine if that happened today!! As one of the first girls to attend the De La Salle let me also be the first one to add to this blog. I was at the De La Salle from 1967-69. A group of girls from the Blessed Sacrament and the Sacred Heart attended classes at the 6th form as there were only 2 A levels offered at the Convent. Brother Wilfred was head and had to put up with us. Brother Mark was my history teacher and after over 40 years he and I have become friends and have frequent e-mail conversations. I had the pleasure of flying over from Vancouver to his reunion at the Ship in Brighton. I moved with my husband and Steve Powell to Vancouver, Canada via LA in 1970 and have been here ever since. You may have seen the little event we had here in February called the Winter Olympics. It was a two week party and absolutely marvellous. B. Mark has visited my family here a few times from Peru where he now lives with the Brothers in their school there. Very sadly Steve died, like his father before him, in his early forties after returning to England and making a fortune in the antique business. I am also in touch with Brother Edward who taught English. He left the order and is now Peter Bostock and lives with his wife Donna in Chicago where I visited him this summer. Mark recently put me in touch with Des Horsfield and he told me about this site. Small world, I still have one of the pictures Des painted in 69. A black and white painting that I still don’t understand. I have fond memories of the De La Salle and how different it was from the convent. I remember Mark taking us out on the lawn for some history lessons, the basketball game against a visiting team from Sweden where I managed to play for a short while until I got kicked out, the King’s Head which we attended as much as class and Mark standing at the front of the class saying ‘so what’ after one of us gave a review of our homework that we thought up to that point was a masterpiece. Vic Craggs was Head Boy, the Chevalier twins could not be told apart and Richard, Danny etc were all there. I also became a lifelong Man U fan after Brendon took me to see them win the European Cup at Wembley. Canada has been good to me and Vancouver is a terrific place to live but I still miss England and go back to visit my sister Jackie who was two years younger so was at the De La salle from 69-70. I supppose the Michael Wilkinson is probably the brother of my friend Margaret. Other girls who went to the De La Salle were Lauren Atallah, Denise Marcantonio, Angela, MaryAnne, Teresa Wood and Nora Gibbons. M e-mail is valeriejenkinson@telus.net or I’m on Facebook if you were a classmate I’d love to hear from you. OMG. I can’t believe they let girls in! Hi, I was at the college from 1956 to 1960, I do remember some of the names mentioned above. I remember the brothers for the beatings they gave us, particular bro Bede and Benedict (the American one), and the kids from Queen’s Park School picking on us if we went into the park. Happy days. Hi everyone, I attended XVC during last year 65/66 then on to DLS. Queens Park kids still picking on us 1st years then. Vivid memories of the Quad 5-a-side, annual school panoramic photo, Mr Smith’s white slipper, Mr Boyle taking Chemistry, Bro Keiran making me jump over chairs to gain height and distance during Long Jump practice! Few more names I can add to the list from 65/66 – Bro Eugene, Mr J Smith?, Mrs Lewis?, Bro John. Please publish through Friends Reunited if there is another reunion. I was at Xaverian from 1966 and left De La Salle in 1970. It’s good to hear all the names Brian Guyver, Brotheres John Patrick, Wilfred, Athanasious Austin, Micheal, M and B Smith, Yes Mr Sadek the Maths teacher, and so many more. I remember at De La Salle some lady nicking the lollipop man’s lollipop and shoving it over the school wall. As a science student at A Level I recall the good explosions Brother John demonstrated in the grounds. Good wishes to John Sellars and Mark Milton if you see the site. Oh yes also brother Kieran for training me in athletics eventually getting me the Sussex 880 yards championship. I just found this great picture at http://www.regencysociety-jamesgray.com/1949/source/62_xaverian_college_interi.html of detail from the chapel interior including the wall frieze and some of the organ pipes. Does anyone remember Mr Horton playing the organ? I had to pump on the bellows lever as I could not hold a note. His son Ronald was also at the school. This would be in the early 60s. Amazed to find this page. So many memories flood back – having progressed through life its funny how one forgets the little things, yet they are still there waiting to be prodded forward. I was at XC from 60 to 66, the last year before the move to Upper Drive. Anyone remember me? I was “four eyes” or “Beardy” as Bro. Michael once inadvertantly called me in front of my father. My memory of Mr Kerr, the French teacher, was his accent. Unfortunately it was not a French accent. He was a good shot with the chalkboard eraser which was wooden-based. Ouch! He always wore his black teacher’s gown in class and at one point we had a Mexican lad who had a pair of scissors and as Mr Kerr passed down the aisles would bend down and shorten his gown with quick snippets. Whether he ever noticed, we never found out. I was at Xaverian and then De La Salle from 1965 until its final year in 1971. I’m still living in Brighton and am just about to retire after 35 years teaching Drama. My friends were Andrew Makinson, Phillip Randall and Cliff Lynsdale, all of whom I see regularly. Brother Mark was my History teacher, and it’s good to see he’s still out there. My very favourite teacher was Brother Eugene, the most individual and unique person on the premises. Does anyone know what became of him? He had so many ‘catch phrases’, such as “How many pages?”, “Before you go home today, you will hand me an essay”, and, most of all “Don’t be (he paused dramatically)…suburban”. I’ve tried to follow this advice ever since. I would love to hear from anyone out there who remembers me or those times. Simon Heath. I was amazed to find this page. I was at Xaverian / De La Salle from 1961-68 and remember many of the names mentioned in the contributions. It would be good to have a reunion sometime. Are you the same Slade with the good voice in our choir that Brian Guyver put all of his effort into? If so I am pretty sure we were in the same year. Well done David Spear for encountering Bro. Augustine and giving him a full and frank appreciation of his disciplinary methods. I would have done the same if the circumstances had arisen. I remember that I was in mortal fear of him when he was Obergruppenfuhrer at XC. Yes, I remember the boys of St Luke’s and their bicycle chains. I was standing outside the main gate of the school when one walked casually by and wrapped a chain around my leg. Did that smart! I remember Brian Guyver with affection as oddly I do for Mr. Lambert as he encouraged my lifelong interest in history. It was a shame he took his own life. Just a note for Valerie Jenkinson, whom I remember well. There were two large families of Wilkinsonwhich leapfrogged each other through the Catholic schools of 60s Brighton. Joe Wilkinson was best known to me of the Rottingdean Wilkinsons, of whom Margaret was I think one. The Montpelier Road Wilkinsons, Michael, Mary, Paul, Teresa and Patricia, were my lot – the other lot. As far as I know, we were not related. Their family was Lancashire to our Yorkshire. I attended this great school in the early 60s with Brother Beed as my first form master & then finishing with Mr Guyver whose trademark was his swagger stick (which I still have part of, as he became a good family friend). I have fond memories of the good times & great friends I had there. I also recall the bike chains from St Luke’s & the smoking in the Pepper Pot up the road. Great times! I have seen references to maybe compiling some kind of forum or newsletter. If there is enough interest I would be prepared to start something off with an initial e mail list. I have e mailed people I have been in touch with, and also those whose e mail addresses appear on this site. If anyone else thinks this is worth pursuing pehaps they can circulate their own contacts and e mail me on mikedav1@cytanet.com.cy. I was at the Xaverian College, Queens Park, from 1958 to 1966. My father was a border in the 1920’s & my younger brother Tony,who sadly died a few years ago,also attended. I have very fond memories of my days ay XC – A level Art with brother Patrick, Maths with brother Michael, Latin with brother Mark.These brothers really helped to shape me for a good start to “Life afterschool”. I remember morning assembly in the yard, playing in goal for the 1st eleven, football competitions in the yard – our team included Ken Haslam, Paul Lewis & Ron English. I still meet up with Ken & Paul regularly. I remember Murray, Ainscough, Townsend, Phil Adkin, Chris Phillips, Joe Wilkinson, John Mealyer, Nigel Davis, Dominic & Simon Nichol, Peter Beard, Horton, Peter Joyce, Stephen Potter, Nick Peyton, John Ward, Andrew Grant, Pat Rimell, Andrews, Mills, Wilson. The headmasters in my time were brothers Nathaniel, Augustine & Elwyn. The reference to “ear twisting” by David Lewis must be Mr Kerr! I started up my own accountancy firm in Brighton 34 years ago & continue to practise from offices in the centre of the town. I’m semi retired, my yougest son is now heavily involved with the business. It would be good to hear from any old XCMA5KL’s – my email is pad@brightontax.co.uk. My daughter found this site, what a gold mine. The memories come flooding back from my time at Xaverian 1952 to 58 with the McEwans x 2, Ray Loughnan, Peter Burholt or was it Burford, Duckworth, Durrants x 2, Purnells x 2, Bondetti who used to regularly thrash me in Boxing, David Read, Rickards x 2, Gibbons. My brother Hugh was two years ahead of me and sadly passed away due to an epileptic fit in 1994. Hugh will be remembered for bringing our neighbour’s goat Lucy to school daily to graze on the grassy banks. Some of the most enjoyable times I remember were weekend expeditions to historical sites organised by the Purnell brothers. My school days were not my happiest as I was firmly in the bottom quarter of the class, however the education I received, such as it was, served me well as I managed to obtain officer status in the Army before entering banking. My wife and I retired to Cyprus in 2005 and welcome any old school pals who might be visiting Limassol, Cyprus. I apologise for not remembering more classmates. Greetings Tom Paul. Of course I remember you especially on Wednesday afternoons when we played foota at East Brighton. I seem to remember you were a wiz at football, often centre forward. I have just remembered a few more of the class, Brian O’Grady, Bas Barrett, (Leo) Lions, Emmetts X 2, Crowhurst and not forgetting my younder brother, not in the same class Bill Johnston. Yes I had some bad habits then but gave up smoking years ago. My last but one term I believe that I managed to get caned every week. Is that a record? I have just found this XC page with all its wonderful remeniscences. I was there from 54 to 57. I was in the same calss as Roger Durrant, Michael Shelly, Allen, Purnell etc. I have some very fond memories of the school and when I visited Brighton in the late 60s and found the school demolished, I nearly cried. I loved exploring the “banks” (out of bounds) and breaking into the air raid shelter with Durrant – having sawn through the padlock! I was one of the “naughty” boys who used to bring my air gun to school and play with it on the banks – only to find some senior boys there with a huge air rifle! I have since met up with Roger Durrant but have now lost touch. It would be interesting to meet some of my old class mates again if there is another reunion. Tony Keel. Fascinating. I remember this Sports Day; amazing that it was captured on film. I, too, remember this sports day. I was one of the ‘arabs’ attacking the soldiers. Armed with a scimitar cut out of hardboard and painted silver and wearing a sheet and our kitchen table cloth, if I remember rightly! I also remember you David (Kirk) and our form teacher Miss ? remarking that your surname was Scottish for a church. Hi Nick. I also remember you I think. Did you have very blonde hair? It was good fun at Xaverian, do you remember, when they removed the old organ from the chapel and we flattened them and used them as toboggans? Highly amusing and dangerous! Wet afternoon and also just come across this site. I was at XC from ’59 to ’66 (approx) and remember all the teachers mentioned. I’d like to thank Bro. Michael for teaching me the unteachable and getting me through O levels, Bro John for teaching me Chemistry, Bro Mark for teaching me anything, Taffy Davis for giving me a real interest in Geography (but not cross country running) and all the others who allowed fermentation of the seeds which have given me a fairly comfortable life. Like one of the other commentators I too was not a diligent student and as such spent my time in the “B” stream enjoying the attention of Bro Augustine from time to time and whacked on a regular basis. I hope that the conversation you had with him was blunt and to the point! My memories of my school days are mixed but on the whole they were good. I too went on the school trips to Lourdes in the Midi Pyrenees where I now have a small cottage, and to Innsbruck. I cannot remember if that is the same trip as when we went down the Rhine? Unfortunately I have lost touch with all my school chums (my fault) but some of the names above are very familiar so our paths must have crossed. Now married, retired and living in Bucks, UK. If there is another gathering in the future I would love to be to be counted in. Brother Mark, if your reading this – thank you. I too have come across this site by accident. I was at XC from ’60 to ’63. Some of my contemporaries were Bowles, Swaffer, Webb, Basri, Jim Sargeant, Stephenson, Thiru et al. I also remember some of the senior prefects at the time. One name that leapt out was Cirin. Always a friendly and helpful chap. I was told he joined the RAF but was killed in a car crash. Don’t know if it’s true but an awful waste if so. The only one I am still in touch with is Peter Swaffer, apart from a lot of the Polish contingent. I left XC under a cloud (under achieving) but eventually made something of my life. Bro. Augustine was Head at the time and a sadistic so and so to boot. I remember, with much glee, some years later talking to a girl friend about schools. When I mentioned XC and ‘Gus’ she informed me that he was the so and so who ran off with her aunt, the mother of one of the Junior school pupils. I laughed so much I fell out of bed and gashed my head on the bedside table. Such bliss. The most memorable teacher was ‘Taff’ Davis. The vision of him marching down the drive, confronting the painted hordes, wagging a finger at the leaders and then threatening them with an entire pupil attack. What guts. If Michael Bowles ever reads this, does he remember smoking during Mr Kerr’s lessons and blowing the smoke into his desk? Being more interested in pranks, I became a regular on the Saturday morning sessions. No wonder I was asked to leave. In hindsight, what a waste of an opportunity. I am now retired and living in the Minervois region of France and indulging in my passions of rugby, wine tasting (scientific research only) and good food. Healthier pursuits are also undertaken but far too boring to mention. Would be very interested in sharing some happy and not so happy memories. tad.thepole@wanadoo.fr is my email if anyone wants to get in touch. Found this site entirely by chance. My first teaching post was at XC (mostly French 1962-64). I can’t have made much of an impression in my short time there as no one appears to remember me – perhaps just as well! Still, I can’t have been too bad as I ended up as a headmaster in London. Keep checking back – I am sure you will hear from people who do remember you! I was at XC from ’61-66 and remember many of the stories vividly. Very surprised to find the names and memories still alive. Need to give some thought to who and what else I can recall – beyond making gliders and setting fire to them while Miss Baxter was declining some French verbs on the blackboard (so her back was turned) and watching the glider dive to the floor into a heap of smoking ash! Charles.pigneguy@virginmedia.com. Back soon. I am wondering if any one of the Xaverian College students can recall Philip Stevens who I believe attended the college? He was an organist and played the organ at St Mary Magdalene’s Church in Upper North Street, Brighton. I was not at Xaverian College but converted to Catholicism aged 11 in 1951 and was baptised by a Father Bennett at St Mary Magdalene. I met Philip Stevens as a choir boy singing at the church and for a time we had a small number of boys from Xaverian College. I am now 74 years of age. Hello Christopher Fox-Walker. Yes, I remember Philip Stevens well. I was at Xaverian between 1954 and 1959. Philip was much older but he still visited the school regularly whilst I was there. I recall him being a very kind and talented man who was put upon by many of the Xaverian pupils. Thank you Tom Paul. Delighted to learn about Philip Stevens. As you say he was “put upon” by the boys. I met him first in the church as he was about to start some music on the organ. I had left the Christ Church choir in Montpelier Rd. So we started the choir at St Mary Magdalene. I found Xaverian boys rather boisterous which was alarming for a boy of eleven with no similar experience but we managed to form a choir. Philip Stevens as you say was a kind man. I believe he lived with his mother on the Marine Parade. He was I think religious in that English private and personal way. He taught me the way things were done and sung in my then “new” church. Very interesting times in those dreary post-war years; which for many were “the worst of times”. I can’t believe it’s a year since I last visited this site. Always good to come back from time to time. And yes, David Kirk, I did have very blonde hair. Ah those were the days – hair! I also remember David Lewis. I think you lived in Ringmer? If so I recall staying with you one weekend. I remember an autumnal walk through the lanes and fields nearby then, on our return home, settling down to a hot beverage and the latest episode of The Avengers on the TV (with Emma Peel). Strange the things one remembers when nudged. Pondering on those early days, I seem to recall other masters, Messrs Kerr, Lintott, Lambert and a rather rotund master who taught music, but his name escapes me. Mr Kerr taught French with a very broad Irish accent which made conversational French impossible. There was also Bro Lawrence (science) and the very gentle Bro Edmund (deputy Head). Reading the comments seem to bring back floods of memories, long dormant. Must be age and the local wine. Having been dragged through the same ‘B’ classes as you Tad – I remember the same teachers. The only music teacher I remember though was Mr Guyver. Mr Kerr’s best efforts with French never made much impact on me, Irish accent or not. For the past 13 years I have been struggling with Greek, with even less success. I was at Xaverian College after leaving Prep school at Carlton House in Gt College Street. It must have been about 1950/1ish to c’54 I suppose. I am no relation to the Jim Sargeant mentioned above. I don’t know why I was sent there as I am CofE, but Peter Reeve went there and his mother was a friend of my mother so that may be the reason. His uncle was Douglas Reeve the famed Brighton organist at The Dome. Names I do remember are; Garaghan? (Possibly wrong spelling?) From Rottingdean, his father had a bookies shop I think? ‘Impy’ Marshall and his special friend, I think they were Impy 1 & 2 ?? the Forte twins, Dudeney (Jeremy?) whose father had The Plough at Rottingdean. He was at The Dew Drop Inn Peacehaven for years, I last saw him there about ten years ago but he didn’t seem to want to talk. Was it Reynolds or Reynard (Something to do with foxes I’m sure!) who lived up the top of Bristol Gate long before it was extended.We didn’t know one another’s first names in those days! Nor did you fraternise with those in different classes. Being a Non-Catholic did have a few benefits though such as not having to attend services etc! I was never ‘sport’ oriented so used to bunk off which was OK until I bumped into Bro Anselm the HM on the beach one afternoon. My time at Xaverian was limited after that! I remember the metalwork shop and until recently had the wishing well base I made there and still have the wooden ‘T’ from woodwork. None of the above seem to cover my time at XC, you’re all ten years too young!. I was very anti-homework when there were engines at the Garage to be dismantled and that got me into trouble as well! Someone should remember me ? My father had the Bristol Garage at Kemp Town. Some of the other Brothers’ names are familiar though, Felix, Plunkett, Benedict, Bede and Vincent mentioned above. I also remember pumping the organ and keeping the pressure guage at the correct height. Perhaps that explains my lifelong interest in Douglas Reeve…? Been meaning to put this up for a few years but only just got round to it. I thought I had though, perhaps on another page? I had a transport business for many years and and about 25 years ago moved someone into one of the flats on the site. Went past a couple of weeks ago – very sad, only one gatepost left with the word ‘College’ on it. Regards to all. Tim Sargeant. Goudhurst, Kent. Mike, wasn’t there a Tim Reeves in our class? I seem to remember him living near the school and being a drum enthusiast. Someone told me that he joined some well known rock group of the ’70s/80’s. Do you remember a chap called Mike Thiru? I came across him in the 70s and chose not to associate with him. Enough said. One memory I still have is when someone got a copy of Lady Chatterleys Lover, which was subject to a trial at the time. Several of us went up on the ‘ranch’ to read the marked pages. Lots of giggling but no real understanding of what was written. The innocence of being 12. Tad – the name Tim Reeves does ring a bell but I don’t recall any details (maybe though I am confusing with Jim Reeves!). Michael Thiru I do remember – again enough said. I remember quite a few others, but apart from the ones that have posted here I am not aware of their whereabouts. I did get some e mails from a few old boys of various years when I suggested a newsletter or forum but not enough to warrant pursuing. Hi, Ted – long time no see. I live in East Anglia now and have four kids! Been married a few times but that’s life eh! Would like to hear from you . Hi Chris, very long time no see. Would love to ‘chew the fat’ over our missing years. Drop me an email (address in a previous comment above) and maybe skype/facetime. Look forward to hearing from you. Greetings to Danny Cassidy (Christmas Post Office 1975??) et al. I attended XC 1964 to 1970. I started in the prep school with Bro Edmund and Mrs. Lewis (her last class before she and husband retired). Bro Elwin/Edwin was my interviewing headmaster who was browbeaten by my mum into accepting me. This was something she was to subsequently repeat for my sister, Nancy (Blessed Sacrament) and my brother, Andrew (St.John the Baptist) after I had left in 1970 with my O Levels to join Varndean Grammar School. In fact, I was at Newcastle University with Marcus Milton and Peter Bairstow? when I heard the news and we all had a laugh because the mothers had presented the new headmaster of Cardinal Newman with a fait accompli by simply presenting our younger brothers on the first day of term! Needless to say they were graciously and quietly accepted! My eldest daughter has just finished her masters degree at LSE and I told her that one of my friends, Michael “Hoss” Osborne, from school had also done very well at LSE and she asked me for more information which led me to this site and a whole heap of memories which I will try and share in recalling my class photo of 1967 with Bro. Athanasius. I have completed the page with the cuttings and pictures. Thanks. For Paul Gordon (26/08/2010). I met a “Peter Gordon” who was working for one of my firm’s audit clients that was based near the Clock Tower around 1977 and 1978 and who claimed he was an ‘OX’ in the course of a series of lengthy discussions. We exchanged some good stories about the old school and the site and the changes which had occurred since he had been there and which under better circumstances would have been more memorable and enjoyable for both of us. I believe that he may well have had the last laugh in this story of our school’s history with this site. “Truly incredible if true” as Bro Eugene would have remarked. Was he your brother “Charles”, or another close relative? Hi John Gwynn, ex french master extraordinaire! Yes, I remember you well after taking over from Mr Kerr. Who on earth sanctioned that man as a role model to teach french? He was probably ‘cheap’. By the time you arrived, I’m afraid most of us were contaminated with taking the ‘rise’ out of French/Irish oral. I remember you ‘teaching’ in the prefabricated classrooms erected close to the hall. I remember being called by yourself to translate a line on the chalkboard. It went something like this—“Je must-not-pas squashez les mosquitos dans la wall.” I believe I left/expelled before your final days at Stalag 64, much to Heir Augustine’s joy. Pleased you saw the light after a short time and went to further your career in a school where your skills were appreciated. Funny, isn’t it. Most who taught at Xaverian, but I don’t include you or a few others, would probably today be in jail! This short message might get a reaction and I hope it does. But contrary to what I’ve written. Maybe, if schools today administered the same amount of punishment as we got back then, kids today might just have a little more respect. For those of you who are old pupils of De La Salle, I have started a new section for the school. You can see the first new page in the section here. I hope you will post your memories there. And if you have any photos contact me and I will publish them for you. There are a number of photos on Friends Reunited under Xaverian College Brighton. A while ago I suggested a newsletter. There was a reasonable response but not enough to warrant the work to start and maintain one. Comments on this site suggest that some means of exchanging memories and information would be useful and I am wondering if a Facebook Group would be worthwhile. I am happy to kick one off if there is sufficient interest. I have quite a few email addresses – including those on this site. Once up and running members of an ‘Xaverian/De la Salle Group’ could in turn invite/add others that they are aware of. Please let me have your views. I have created a ‘Xaverian College, Brighton group on Facebook. I hope that many will join and share memories, photos and information. The group is open to all former pupils (and teachers) of Xaverian and De la Salle. Please pass on the information to your contacts. I remember many of the names above from the early 60s. So sorry to hear that Tony P died – a good friend. Other friends were Richard Smith, Steve Dryden, Chris Cronin (used to turn his eyelids inside out!). I now live in Cornwall and am happily retired but do return to Sussex on a regular basis. Mike Purnell forwarded to a number of us Old Xaverians Mike Davey’s note above which included a reference to the “My Brighton and Hove” website which I then opened and had a quick rummage through. I typed in “Xaverian College” into the search engine and so here I am. Scanning down the entires brought back so many memories for me. I note that Mike Purnell has posted a number of comments re a number of previous meeting-ups of some nine Old Xavs. I attended XC from 1955 to 1963. As with many of the OXavs, there were both good and bad times, but immesurably the times were good. Thank you Tad Piotrowski for your very kind comments and, as you see, I am alive and kicking. I didn’t join the RAF because I was from “foreign descent”. A former Head Boy, Jimmy Lanfranchi, did join the RAF and became a navigator. Unfortunately, he was killed in a Canberra crash leaving a wife of some six weeks. I was his best man. In answer to Anthony Norris’ question: Some of you might remember that I was shot in the left eye whilst an air cadet with 225 Brighton Squadron. Fortunately it didn’t prevent me from gaining a private pilot’s licence. When I left XC, I went to Hatfield College of Technology (now Hertfordshire University) to study for a degree in Mechanical Engineering with an aeronautical bias from ’64 to ’68. Following graduation I joined Hawker Siddeley at Hatfield as an Aerodynamic Stability and Control Engineer working on the HS 125 Business Jet. In 1970 I joined Britten Norman as a Technical Sales Execitive on the Islander and Trilander sales team. In Sep ’72 I had a complete change of direction and joined the Royal Navy as a Marine Engineer Officer. I volunteered for submarines and served in 4 Diesel “O” class and 4 nuclear powered boats. After a varied career in the RN, I retired as a Commander in April 2002 and joined Bedfordshire County Council as an Emergency Planning Officer, becoming the County Emergency Planning Officer a year later. In 2007 I joined the Cambridgeshire Primary Care Trust as the Health Emergency Planning Officer. Nice to see more people adding to the comments above. I was racking my one brain cell about what has happened to a number of pals from those days. There is a small group of us who meet up for lunch once or twice a year. These are myself, Danny Chapchal, Vlad Cirin, Roger Durrant, Vic Sheppard, Michel Olszewski, Doug d’Enno, Robert Allen, Chris Ogden. All from the same GCE year. But what of many others? I can remember a few names: David Sharp, Dennis Hooper, Brian Quinton, Chris McEwan, Jobling, Jim Salway. I read recently, with sadness, that Geoff Lintott passed away. He had relocated to Greece and taken Greek citizenship. He died a few years ago. I have a lovely ink and wash picture of a church in Portugal by him, which he gave to our family. I thought he was a great teacher. As was Taffy Davies. I am still working – running my own business in the TV broadcast industry. Hoping to retire in March 2015, when I shall be 70..! Cheers all. Hi Kevin. Although you were a couple of years junior to me, our respective parents were quite good friends at the time. They were involved in a lot of fund-raising together. This would have been the very early 60s. What are you doing with yourself these days? My brother Richard told me about this site and I remember most of those on the post from Paddy (Terry Paddenburg) above. Who though remembers Keith Morris and his Ford Prefect and skiving off to the Penny Farthing cafe for a coffee? Hi All, I came across this site whilst planning a trip to Brighton. I attended the Xaverian College from 1961 and then moved to the De La Salle College, Upper Drive. I recognise some of the names of the Brothers and lay teachers. I was in the class with two of the names I recognise here, namely John Hilliard and Desmond Horsefield. Some of the others in the class were William Bond, John Oram, John Coates and Michael Rowan. Its such a long time I can’t remember any of the others. I haven’t been to Brighton since I left in 1971. I’ve been living in Republic of Ireland for the past 40 years. I plan to visit Brighton on April 24 to 26, 2015. If anybody from that class or that period knows me I would be delighted to meet up with you. Hello Tadeusz and Mike. Good to hear from you both – and will go to the FB site and join. Tadeusz, yes I remember your parents. Mine are happily still going strong, living (in their 90s) in Devizes now. My mother continued fund-raising for many years. I am still working, mainly as an advisor on public sector communications to various European governments (I was a UK civil servant for a short while, after a career as a PR consultant): just finished with various ‘missions’ in Ukraine; now regular projects with Estonian government; and celebrating 17 years as a visiting prof at the University of Switzerland. Live in London and have a narrowboat on the Kennet & Avon canal. Hoping to afford to retire sometime around my early 70s – so another 5/8 years – but will probably just keep going anyway… See you on the FB page. A random discovery of this site has certainly stirred some memories. I was at XC 1963-1966 and left in the summer to join the Navy (Fleet Air Arm) to see if I liked it, leaving after 30 years, and flying a desk in MOD at the end. That was followed by 15 years with Airbus. Mixed memories of XC and I was anyway a poor student but it gave me enough to blag my way into Dartmouth and the rest is history. Interesting reading:- I was a pupil in the early 60s. I haven’t got much to add except that during a recent visit to my son in North Carolina, I came across a chapel organ in an historic house. A man in ancient garb demonstrated how the bellows had to be pumped manually. It brought back memories of the school chapel though I never had the privilege (or was it a punishment?) of sustaining the ancient machine that resided there. I periodically travel down from rural Kent to Brighton to visit my mother and now that she can only take short visits, I have the opportunity to reacquaint myself with the idiosyncrasies of the old town. I once took my wife to see the former college site but it was most disconcerting. Some of the old artifacts were there and there were changes in level that related to the original layout but I couldn’t quite tie things up with my memories. If you type ‘3 Attree Drive, Brighton’ into Google and look south on ‘Street View’, then you can still see one of the garden gazebos that has survived. Anyone remember me? I attended XC 1948-1952. Studied journalism, did National Service, extended to a short service commission (£36 a month instead of £24! ), after a spell with the Ministry of Defence joined the Diplomatic Service and travelled the world for 32 years ending as Governor of the Cayman Islands. For the past 20 years I have been a wildlife photographer and writing about wildlife and conservation. I notice there hasn’t been anything added to ‘memory lane’ since November of last year. I hope this is not a sign that us, as old boys, are not thinning out to such a degree as to not be able to post to this site with a few of our memories of the old school. As any of you out there who have read my previous efforts will testify, my time at the old place doesn’t bring back good memories, as the war between Augustine and I finally coming to an end with him expelling me. But there were good times when not bending over to get six of the best. Good friends were made and the football team wasn’t that bad either. I remember fondly of a time during the Brighton School Sports day at Withdean when I knew I had won the hop-step-and-jump before the effort could be measured …. I was the only competitor to get into the sand. Terry Johnson, a name remembered from long ago. You left at 16 despite being by far the brightest bloke in the year with the best results. It seems few of us live in Brighton any more, Jim Scott is in Portugal, Jan Podsaidly has gone to the dark side and is near Crystal Palace. I would like to know what happened to Vince O’Mahoney. You didn’t go on to De La Salle, that had its memories, but the days spent at XC, and before that at St Joseph’s, have special memories. I have a memory of you in the 4 a side football one year as goalkeeper…it was only in this that they let me play on the field (yard) as I spent 7 years as the 11 a side goalie. I am sure we won that year as well… or is that rosy spectacles? Commenting on other posts: Mr Kerr had a 60 a day habit, lessons started after a fag at the door, and finished early as he needed the next as soon as he went out. Miss Baxter’s French didn’t help me, I was kicked out after the mocks. I can’t remember the name of the History and Latin teacher, a Malaysian gentleman. I failed both, but he did teach me some Malaysian…saya piggi passa… odd what sticks. No comments about the testimonials. I was always happy to get a red one, never had a gold one, and only dipped into blue twice, once when I lost all 20 behaviour marks for the week. Anyone else remember these? I’m still hoping to hear about any information on Brother Eugene, who was a unique human being. What became of him? Is he still alive? Does Brother Mark know of his whereabouts, perhaps? Eugene taught us from 1964 until the school closed. He was a very good English teacher and also taught Art for a while, too. Also, is the Chad Sexton Fink in Australia our very own Brother Chad? For those of you who knew Jeff Taylor I am sorry to report that Jeff passed away in November 2017 in Spain after a brave battle against cancer. He attended the school in the late fifties until around 1960. I had always kept in touch with him, he was a good friend and is so missed. Bro Chad was a a white Russian named Chad Brosnofzerovitch. Don’t know about Australia. Having just scanned through this lovely memory jerker, I realise that my email address is now wrong as O2 ceased to provide an email service a few years ago. As Mike Purnell has written, about 9 of us meet up every so often in either London or Brighton. As Mike has said numbers have to be “regulated” because otherwise we wouldn’t get round to chat to all.I’m now well and truly retired and would love to hear from any Old Xavs of my era. I was at Xaverian College from 1961 to 1966 when we moved to the Upper Drive. All the names bring back memories. My younger brother William followed on three years later. Mr Kerr was a scream and Brian Guyver an exceptional teacher. Like many before me I stumbled across this site when trying to find out what happened to the old Xaverian College buildings. I was at Xaverian from 1961-66 and then DLS 66-68. I developed an interest in photography whilst at DLS and have many photos taken at school – group photos, swimming club, 4-a-side, dancing with the girls, chemistry with Bro. John, on the roof, and of course the raising of the girls slip on the roof flagpole (co-conspirators were Ian Ackworth and Michael Rowan). Reading through the comments helped me put names to faces and I think I have most of the 66-68 years covered. I’ll look into posting them on the Xaverian/De La Salle Facebook. Emigrated to Florida in 1985, retired from chemistry career in 2010, now enjoy travel, photography, cooking, and genealogy amongst other things.